Stevante Clark jumps on the dais and shouts at Sacramento Mayor Darrell Steinberg, left, during a city council meeting in Sacramento, California, March 27, 2018. The embattled Sacramento City Council whose meeting was interrupted by the brother of an unarmed black man who was shot 20 times by police will not meet Wednesday out of respect for the victim's family and his wake, according to the California capital's mayor, Darrell Steinberg. Stephon Clark, 22, was fatally shot by police March 18 in his grandmother's backyard. Officers said they initially thought he had a gun. He was holding a cellphone. On Tuesday, Clark's brother, Stevante, and other protesters disrupted the city council meeting, which had opened with a moment of silence and was intended to address his death. 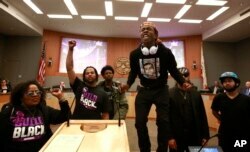 Stevante Clark stands on a desk as he shouts the name of his brother Stephon Clark, who was fatally shot by police a week earlier, during a meeting of the Sacramento City Council in Sacramento, California, March 27, 2018. At the packed meeting, Stevante Clark jumped on the dais and demanded to speak, saying he didn't think the council would make meaningful changes. Along with the City Hall protests, demonstrators descended on the city's basketball arena, the Golden Center, blocking the entrance and forcing the delay of an NBA game between the Sacramento Kings and the Dallas Mavericks. The Kings released a statement that the game would be delayed and that the arena entrances were "temporarily closed." The game started a few minutes after the scheduled time, but the 17,600-seat arena was sparsely populated. Police have called for calm as the Clarks hold a wake Wednesday. Civil rights activist Reverend Al Sharpton is expected to deliver the eulogy at Clark's funeral Thursday.